In a world of human-produced and natural environmental hazards, the need for environmental education has never been greater. Yet, schools rarely teach school-age children about these toxins in the environment and the associated health risks, according to a new book, Teaching Environmental Health to Children: An Interdisciplinary Approach, co-authored by Professor David Hursh and alumnae Camille Martina ‘05 (PhD) and Hillary Davis ’84 (EdD) of the University of Rochester’s Warner School of Education, in collaboration with Professor Michael Rush of Johns Hopkins Center in Urban Environmental Health. The book, released this fall from Springer Publications, provides an interdisciplinary look at how schools can educate children about everyday toxic materials that pollute our air, water, land, and food and how students can reduce their own health risk and the risk of those in their family, school, and community. By highlighting activities and curricula developed at nine U.S. universities, which were funded by a grant from the National Institute of Environmental Health Sciences (NIEHS), the authors seek to extend these lessons to classroom teachers of all subjects and grade levels to include environmental health in their own teaching. Together, the environmental health project sites developed hundreds of lessons, all of which are available on the NIEHS website. Teaching Environmental Health to Children provides an overview of some of these lessons, including the rationale, methods, and resources, so that educators have a basis for creating lessons appropriate for their students, schools, and communities. Some of these lessons look at health issues, including lead poisoning, the connection between air pollution and asthma, and food preparation and safety, among many more. Hursh, an associate professor in Warner’s teaching and curriculum program, got involved in the push for environmental health nearly a decade ago when he became a part of a University project, funded by NIEHS and titled My Environment, My Health, My Choices, that exposed him to the health issues that people, particularly in developing countries but also in the U.S., face regularly. His research and writing focus on educational policy, neoliberalism, and teaching environmental sustainability and social studies. In the summer of 2010, he developed and taught lessons on energy and environmental sustainability in an elementary school in Kampala, Uganda, and then returned a year later to continue his work in promoting environmental health through education. Hursh, who is currently on partial leave from the Warner School, currently serves as a visiting research scholar during the 2011-12 academic year at Columbia University’s Earth Institute, where he focuses his attention on education in ten sub-Saharan African countries that are part of the Millennium Villages Project. Martina is a research professor at the University of Rochester’s School of Medicine and Dentistry, where she has taught an environmental health course, titled Medical Ecology, for several years. Her primary appointment is in Community and Preventive Medicine, Division of Social and Behavioral Medicine with a secondary appointment in Environmental Medicine. Her research interests in education are the structure and function of social contexts, institutional culture and agency in promoting academic achievement in underrepresented populations, as well as educational and institutional policies that support innovative and integrated interdisciplinary instruction. She collaborated with Hursh on the University’s NIEHS-funded project, first serving as a research assistant evaluating the project and providing curriculum development and instructional support, and upon receiving her doctorate in 2005 continued her work on the project as a professor in environmental medicine. 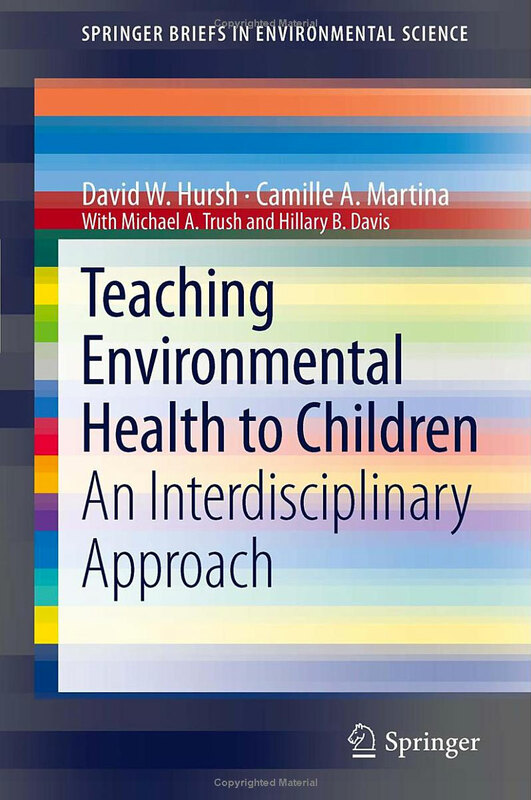 Martina and Hursh co-authored a research article and book chapter in 2009 that culminated with the release of Teaching Environmental Health to Children. Davis is the president and senior researcher at Technology Learning Consortium Inc., where she specializes in working with organizations and projects to develop, support, and evaluate student-centered learning environments. She is the author of books on questioning, minds-on science, building a culture of literacy, and digital literacy. Founded in 1958, the University of Rochester’s Warner School of Education offers master’s and doctoral degree programs in teaching and curriculum, school leadership, higher education, counseling, human development, and educational policy. The Warner School of Education offers a new accelerated option for its EdD programs that allows eligible students to earn a doctorate in education in as few as three years part time while holding a professional job in the same field. The Warner School of Education is recognized both regionally and nationally for its tradition of preparing practitioners and researchers to become leaders and agents of change in schools, universities, and community agencies; generating and disseminating research; and actively participating in education reform.